The research of Dr. Hongfei Lin and his team was recently featured on the cover of ChemSusChem. Other contributers to the paper, Coupling Glucose Dehydrogenation with CO2 Hydrogenation by Hydrogen Transfer in Aqueous Media at Room Temperature, include Dr. Guodong Ding, Dr. Ji Su, Cheng Zhang, Kan Tang, and Dr. Lisha Yang. Conversion of CO2 into value‐added chemicals and fuels provides a direct solution to reduce excessive CO2 in the atmosphere. 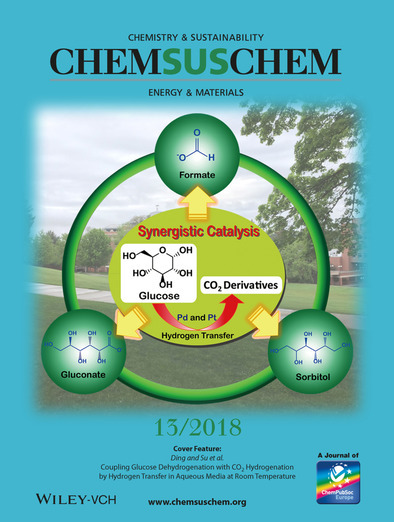 Herein, a novel catalytic reaction system is presented by coupling the dehydrogenation of glucose with the hydrogenation of a CO2‐derived salt, ammonium carbonate, in an ethanol–water mixture. For the first time, the hydrogenation of CO2 to formate by glucose has been achieved under ambient conditions. Under the optimal reaction conditions, the highest yield of formate reached approximately 46 %. We find that the apparent pH value in the ethanol–water mixture plays a central role in determining the performance of the hydrogen‐transfer reaction. Based on the 13C NMR and ESI–MS results, a possible pathway of the coupled glucose dehydrogenation and CO2 hydrogenation reactions was proposed.